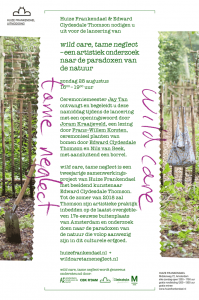 Please RSVP to info@wildcaretameneglect.nl to reserve a place. 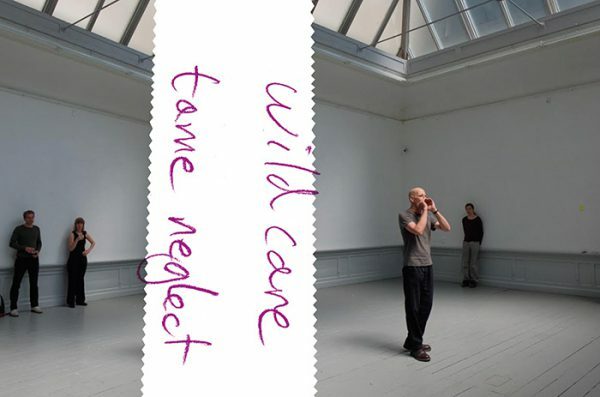 On Sunday the 14th of May - as part of wild care, tame neglect at the Frankendael Foundation, Amsterdam - artist Toine Horvers will lead a public workshop. Participants of the workshop will be guided throughout the day by Horvers in performing voice exercises in the landscape. It was a damp evening on the 14th of January. We arrived by bike at Crimmp to see Toine give a solo performance. I’d known Toine for a while but had never seen him perform. I was excited but to be honest I didn’t know what to expect. Chairs were laid out in the largest circle possible in the space, the backs of the outer most chairs touching the two walls. In the centre was Toine, a single incandescent light bulb hanging from a cord above his head. Cupping his hands into an improvised megaphone he calls out ‘Noord’. He turns ninety degrees on the spot and calls out ‘Oost’. Again ninety degrees and ‘Zuid’. Then ‘West’. He continues slowly spinning. At each axis calling out the direction, his voice now modulating with each rotation and the sound of the word extending: ‘Nooooord’ ‘Ooooooost’ ‘Zuuuuuuuid’ … slowly at first, but now almost touching each other. They meet. Touching hands across the vastness of the globe their difference morphed into a rhythm of point and refrain as Toine continues to rotate methodically. I’m dizzy, no longer there in that room but transported to a space without limits - only direction. 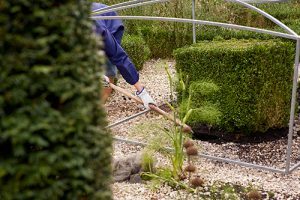 Taking as its epicentre the central pond of the Frankendael garden, the workshop will expand outwards using the body, voice and rhythm. Throughout the day Hovers will choreograph different group exercises with the participants, collectively bringing about a new way of experiencing space and movement. The two main starting points of these exercises are the use the voice precisely positioned in space and time, and the use of observation and displacement through description and repetition. How we look at and understand a location is bound up with the kinds of activities we do there. You notice different things. There are many reasons for being at Huize Frankendael and each would bring a different reality to what Frankendael is. Are you there to get married, there because you are a waiter in the restaurant? Do you live next door and come to escape your home for a moment? Are you out for a Sunday stroll in the garden? Toine Horvers is an artist who makes observations on various micro and macro levels into the centre point of his practice. Where are you and what do you see? A simple enough question yet when you say it like you mean it, it starts to shift and change. Where are you and what do you see? Now really look… what do you see? Look further. When seeing becomes physical, bodily, that’s where Toine comes in. Toine Horvers is a performance artist and a curator whose practice consists of abstract systems and procedures for making language appear in time and space. Horvers’ recent work concentrates on voice performance (solo or multi-voiced), and descriptive writing. Recent publications include: 'Chartres, one hour of sound in a Gothic cathedral' published by Onomatopee and 'May, the sounds of birds in a dune valley at the head of the isle of Schouwen', number 143 in CBK Zeeland's Slibreeks. Horvers curated performance events such as Words Live (1 to 4) at De Player, Wall Gallery and Stichting B.A.D, Rotterdam, and St. Perdu, Amsterdam. Recent performances include 'Waves 2011' at Baltic Centre for Contemporary Art, Newcastle UK and Croxhapox Gent 2017, 'Rotations' Miam Centre for advanced studies in music Istanbul 2016, 'Draaien/Rotating' OCW Rotterdam 2017, 'Scheepshoorn' Arte Concordia Rotterdam 2015, 'Language' Bangalore India 2016. From 2004 to 2014 he organised the programme of Sub Urban Video Lounge in Rotterdam. The workshop is open for all, places are limited to sixteen people so please RSVP to info@wildcaretameneglect.nl to reserve a place. Edward Clydesdale Thomson, workshop, 2017.